I argue for a living. I often deal with hacks, liars, and agenda-driven fanatics. But never in a quarter century of being in court rooms have I faced such a blizzard of constitutional illiteracy, technical ignorance, flabby reasoning, and outright lies as I have dealing with people who think our Second Amendment rights are up for debate. Our rights are not up for debate. But, as a courtesy, because talking is the way a free people should endeavor to solve problems, we should debate them anyway. Rational discussion beats the alternative – many of us are vets who saw the alternative overseas – even if the other side prefers emotional blackmail using articulate infants to bum rush their anti-civil rights policies. So, here are seven (it could have been 50) of the most annoying – and dishonest – arguments you will hear, and how you can fight them. 1. You Don’t Actually Have The Right To Own Guns Because You Aren’t In A Militia! Nope. That’s wrong right off the line because Heller v. District of Columbia (2008) 554 U.S. 570, holds as a matter of settled law that individuals have the right to keep and bear arms regardless of their militia status. The Second Amendment provides: “A well regulated Militia, being necessary to the security of a free State, the right of the people to keep and bear Arms, shall not be infringed.” Justice Scalia, writing for the majority in Heller, dismissed the argument that this right somehow, despite the clear text, belongs to “militias” and not individuals. Your opponent may not like that, but that’s what Heller says. That’s what the Constitution says. And, as usual, Justice Scalia’s reasoning was incisive and compelling. He dismissed the militia reference as merely announcing just one purpose of the Second Amendment, not its only purpose. The prefatory clause does not limit the scope of the right, but even if it did that interpretation would not change the nature of the right. The “militia” is, by statute (10 U.S. Code § 246), “all able-bodied males at least 17 years of age and … under 45 years of age who are, or who have made a declaration of intention to become, citizens of the United States….” This demonstrates the Founders’ intention that “able-bodied” citizens must protect their communities and Constitution. History teaches, and Justice Scalia observed, that these citizens maintained their personal weapons at home, and were ready to act when needed – whether it was to stop Redcoat gun control activists at Lexington and Concord or to mobilize to defend Korean stores during the Los Angeles riots in 1992. I was there with the Army in LA, by the way. Don’t tell me chaos can’t happen here. 2. But Wait – It Says “Well-Regulated Militia.” Doesn’t That Mean The National Guard? No. Guard soldiers and airmen are part of the militia, but the Guard is a component of the United States Army or Air Force. During my time in the Guard, my uniform’s service tape read “U.S. Army” and I held a U.S. Army Reserve commission. Guard members are part of the standing military; the interpretation liberals assert would render the Second Amendment meaningless, which is what liberals want, but that’s not how one interprets a legal text. Well, aren’t citizens with guns not “well regulated?” No. Congress regulates the militia – Article I, Section 8, Clause 16 of the Constitution provides that “The Congress shall have Power To ...provide for organizing, arming, and disciplining, the Militia….” And Congress has decided what “well regulated” means. It means the current level of regulation, since that is what Congress has imposed. It could enact further regulation, if it wished. If the Congress feels like decreeing that every member of the militia (which Congress can expand as it wishes to better reflect society) must be armed with an AR15, it can. (Hint hint). And no, the rest of the Amendment limits the ability of Congress to disarm “the people,” so it can’t “well regulate” the right out of existence. 3. Well, Scalia Still Says Guns Can Be Regulated, So We Can Ban Modern Weapons! No. What the anti-civil rights crowd likes to do is cite language from Heller that recognizes a few traditional exceptions to when and what arms may be kept and borne – in other words, gun banners try to have narrow exceptions swallow up the rule. Always pivot back to and demand that these people recite the basic holding: The Second Amendment recognizes the right of citizens to individually keep weapons in common use for lawful purposes, including self-defense. Liberals hate when you do that, especially when you confront them with the fact that Heller protects weapons “in common use.” In that case, it was handguns. However, the fake assault weapons that liberals hate (which are involved in a tiny fraction of crimes) numbers in the millions. AR15-style weapons are in common use. Deal with it. 4. We Just Want Common Sense Gun Regulations Since There Aren’t Any Now! Oh, I guess they never filled out a Form 4473. You know, all the lies about it being “easier to buy a gun than a Pepsi” do not exactly inspire us to believe that the gun banners’ pleas for “common sense reforms” are anything but the first steps toward confiscation and disarming our citizenry. Lying demonstrates a lack of good faith. Nor does the fact that none of these “commonsense gun regulations” addresses the problems they cite. Ask your gun banner pals which reforms they want that would have stopped any of the recent killing sprees by people who are not conservative observant Christian or Jewish NRA members. Background checks are their usual go-to. Those are already a thing, and the scumbags all passed, except for the one scumbag whose check the FBI screwed-up. You know, instead of hassling citizens who have committed no crime, maybe we ought to demand our law enforcement agencies start doing their damn jobs. 5. You Have Blood On Your Hands! Actually, don’t stop them when they go this way. Scummy drama queen invective like this is proof that our stubborn defense of our rights is working, and that they have nothing else but to lie about us. Their hysterical shrieking helps motivate other people who may not have been paying attention to protect their rights. After all, “You support murdering children!” is a super-effective way to alienate normal folks and highlight the essential dishonesty of the gun banners. 6. No One Wants To Take Your Guns! This is another classic lie. In fact, that’s exactly what liberals want to do. How do we know? They tell us when they think we are not looking – and, with more frequency, when we are. It’s fun when they say they don’t want to take your guns, then say you have to give up your ARs. If your opponent is getting wistful about Australia’s gun confiscation, he wants to take your guns. Let’s get serious. They all want to take your guns. Why? Two reasons. First, it takes power from the citizenry. Liberals love that. Second, gun rights are important to normal Americans because the fact we maintain arms means we are not mere subjects. We are citizens, with the power to defend our freedom. Liberals hate that we have that dignity; taking our guns would humiliate us, and show us who is boss. They want to disarms us not because of the gun crime – name a liberal who wants to really do something about Chicago as opposed to hassling law-abiding normals – but because they hate us and want to see us submit. Even the Fredocons are getting into the act, which is no surprise since Never Trumpism is always the first step downward to active liberalism. Pseudocon Bret Stephens demanded that America repeal the Second Amendment in the New York Times in October 2017. Fellow puffcon Ross Douthat simpered something similar, and the Captain Stubing of Conservatism, Bill Kristol, tweeted his concurrence. 7. The Second Amendment Is Obsolete And This Stuff About Defending Against Tyranny Is Crazy! Obsolete? Isn’t our Constitution a living document that should change with the time? Well, in the last couple decades gun rights have expanded massively across the country via legislation – faster and more thoroughly than gay marriage did – so the Constitution is evolving toward recognizing more gun rights. 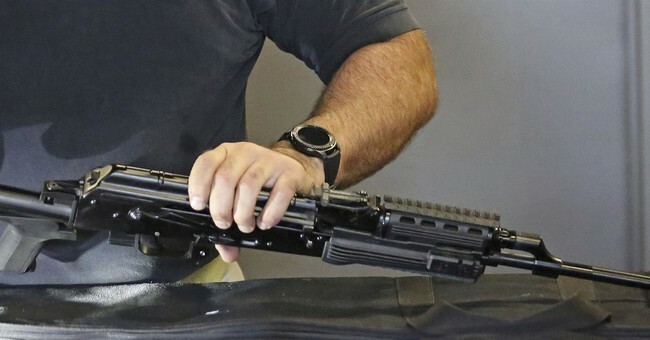 Anti-civil rights holdouts like New York and California are failing to recognize that the Constitution changes with the times and stuff, and those states must conform to the new consensus about the freedom to keep and bear arms. That’s how this works, right? Right? Did you liberals say that our government is always going to be benevolent? Sorry, I can’t hear you over the sound of the revelations of government misconduct and oppression of individual citizens for their views. Also, since Trump is totally Hitler for real, isn’t giving him a monopoly on force a bad idea? Finally, there is the claim that “a bunch of violent country guys with rifles couldn’t take on the government anyway.” First, at the threshold this is a disgusting slander. Violence is a last resort justifiable only in cases of outright, active violent tyranny where no political or judicial processes are available. The idea that American citizens, many veterans, are somehow chomping at the bit for a civil war is right up there in the Liberal Slander Top 10. American citizens do retain the right to use force to stop such tyranny. If some government decided to say, round up Jewish citizens, violence would be appropriate to protect our fellow citizens as a last resort. Luckily, our street level law enforcement personnel and military would never do such a thing, but that does not mean a situation could never arise where people acting under the color of authority might seek to violently violate the Constitution and deprive citizens of their rights and lives. The Founders were wise to recognize our citizens’ right to have the ability to resist violent tyranny. But could citizens effectively resist violent tyranny? That’s a long story – someone ought to write a novel on the subject – but the short answer is, “Yes.” As Vietnam, Iraq, and Afghanistan all teach, a decentralized insurgency with small arms can effectively confront a modern police/military force. Of course, in America’s case, the police and military rank and file are much more likely to sympathize with their fellow citizens and freedom than with some hypothetical tyrant, making such a horrifying scenario highly unlikely – though not utterly impossible. But the bottom line is that two untrained idiots with handguns shut down Boston. What do you think 100 million Americans – many trained and some battle-tested – could do with their rifles? (To get a feel for the level of utter dishonesty among our opponents, just scroll down to the comments and count the lies about me somehow supporting civil war in this column). The liberals want to have a conversation about guns. So should those of us who love freedom. We have the facts. We have the law. We have the right. And we have a choice. Citizens bear arms and hold a veto over tyranny. Serfs obey their masters because they have no choice. Pick one.